Deferred adjudication is a tricky thing, especially when it comes to potential new hires. It can reveal the bad conduct of a potential employee, but often doesn’t show up in the average background check. However, we believe you should always have the facts before you make decision about the future of your business. So let’s dive right in. It’s when a defendant enters into an agreement with the court, where the individual agrees to plead “guilty” or “no contest” to the offense (in other words, they aren’t going to argue their innocence), and serve a probationary period, which may include training, counseling, or community service. If they fail to meet the terms of probation, the court can use their plea to find them guilty without a trial. However, if they successfully complete the probation, the case is dismissed. How Does It Affect Your Employment Practices? In case you’re wondering, this should be stated plainly: Employers are not prohibited from considering dismissed cases in most states, and there is no prohibition of this under federal law. But when considering dismissed cases, the onus is on the employer to gather enough information to determine if it is reasonable to believe the individual engaged in the underlying conduct. To make it easier, you only need to remember that a condition of entering into a deferred adjudication agreement is pleading guilty or no contest, which means it’s reasonable to believe that the person engaged in the conduct. Had they failed to properly finish their probation, the court would have used the plea to find them guilty beyond a reasonable doubt, which is far beyond the standard for employers. Will the Deferred Adjudication Show Up or Not? If you’re feeling like Sherlock Holmes and are able to conduct your own background check by directly checking the records of the county in which the person had the case, you will almost certainly see the dismissed case, often with a note that it was dismissed upon completion of deferred adjudication probation. The Fair Credit Reporting Act – It prevents screening companies (“consumer reporting agencies” in the parlance of the FCRA) from reporting non-convictions older than seven years unless the individual is expected to earn more than $75,000 annually. State Laws – Some state laws and local ordinances prevent screening companies from reporting non-convictions regardless of age – even when the employer can legally consider the record. That means you probably wouldn’t see the deferred adjudication case on a background check for any positions being hired in that state. How Professional Your Screening Company Is – Rather than try to keep up with the ever-changing laws at the state and local level, some screening companies only report convictions to their clients. Taking it a step further, some only report convictions for the last seven years. In short, they’re trying to ensure compliance by creating a one-size-fits-all rule nationwide, even if your local laws allow you to have all the information you paid for. You can ask your current screening company about their policy, but the narrower their reporting practices, the worse of a job they’re doing for you. 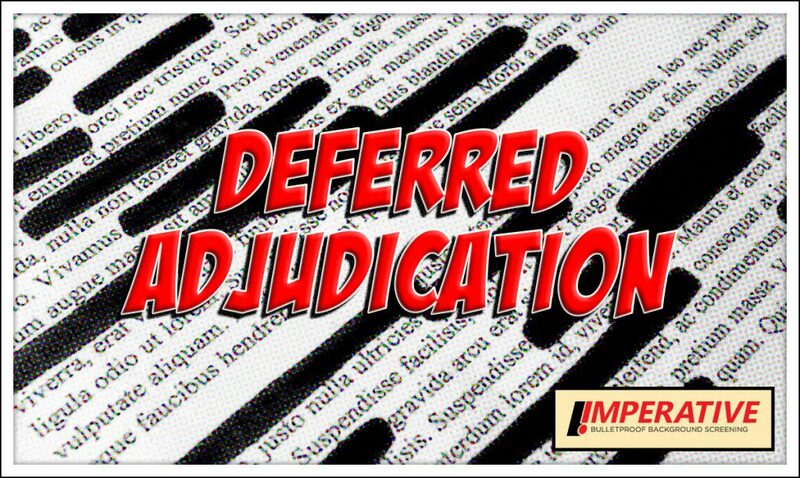 Also, in many jurisdictions, a defendant can petition the court to seal or expunge cases dismissed upon completion of deferred adjudication. Once this has happened, the case should not show up on any background check, with the possible exception of those performed by the government for security-sensitive positions. It’s our policy to pass on all records that we can legally report to our clients, regardless of age or disposition, so long as they aren’t prohibited from use by a state or local ordinance. We don’t want to give our clients the rope to hang themselves with. We briefly addressed this earlier, but some clients may still want to know if it is “fair” for an employer to consider deferred adjudication cases that were dismissed. In deferred adjudication cases, the court believes that the defendant’s plea is sufficient to convict. Following that logic, it’s reasonable for a potential employer to believe that the person engaged in the alleged conduct. The whole reason for asking about criminal history or conducting background checks is to identify past behavior that may suggest any risks involved in prospective or current employment. By shifting focus to the behavior and its relationship to the position, you’re only doing what’s best for your company. Wondering if Your Background Checks Are Getting the Job Done? Download our e-book Seven Steps to Making Bulletproof Hiring Decisions for more on these and other issues employers need to consider when fairly evaluating criminal records while building a safe and effective workforce.